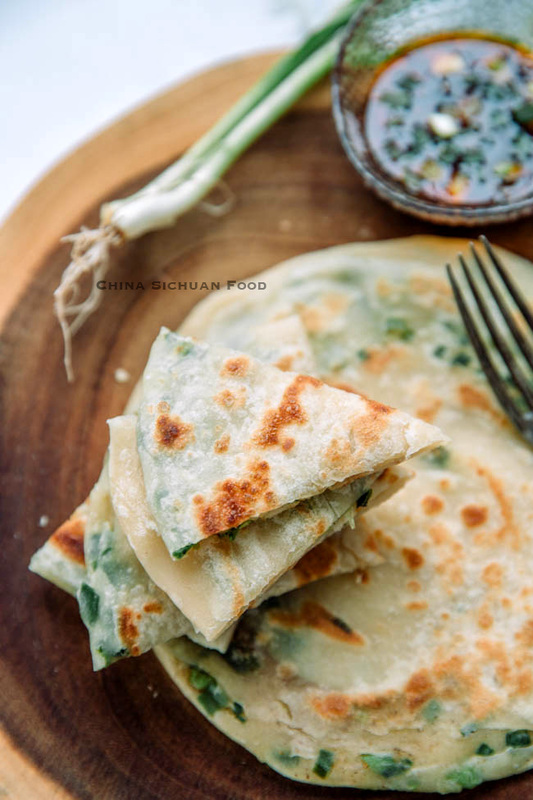 Chinese Scallions pancake also known as green onion pancake or Congyoubing is one of the famous and traditional Chinese street foods and ideal Chinese breakfast. Those crispy and aroma pancakes are available all around China. 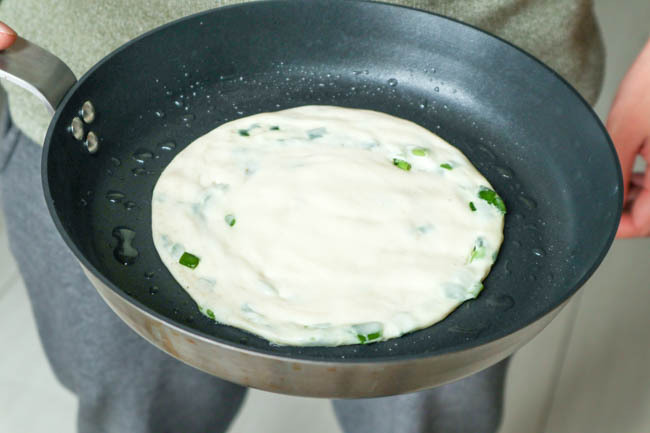 Making your own scallion pancake at home is easy and enjoyable. I know that many Chinese restaurants in the world providing this lovely pancake. However, making some at home is a nice experience. Only with simple and everyday ingredients, we can make our own extremely aromatic scallion pancakes. In China, there are, actually, several types of scallion pancakes. 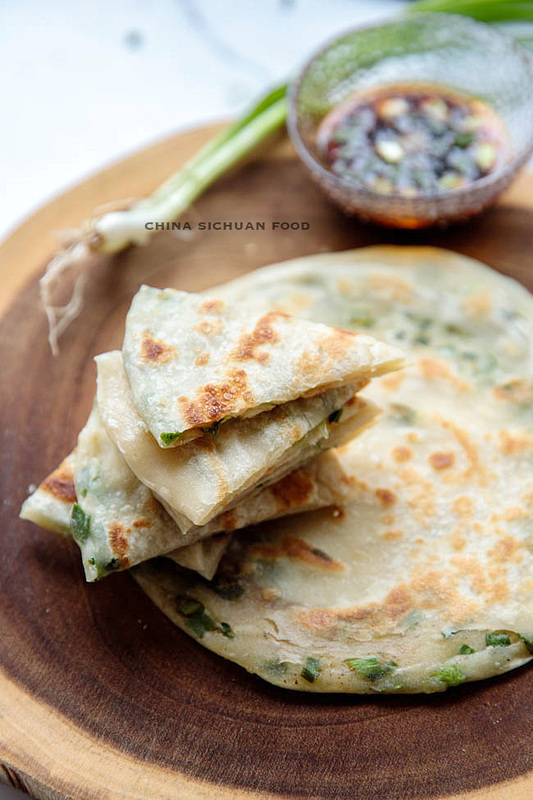 In northern provinces, scallion pancake (this version) is thinner, chewy and with less oil. 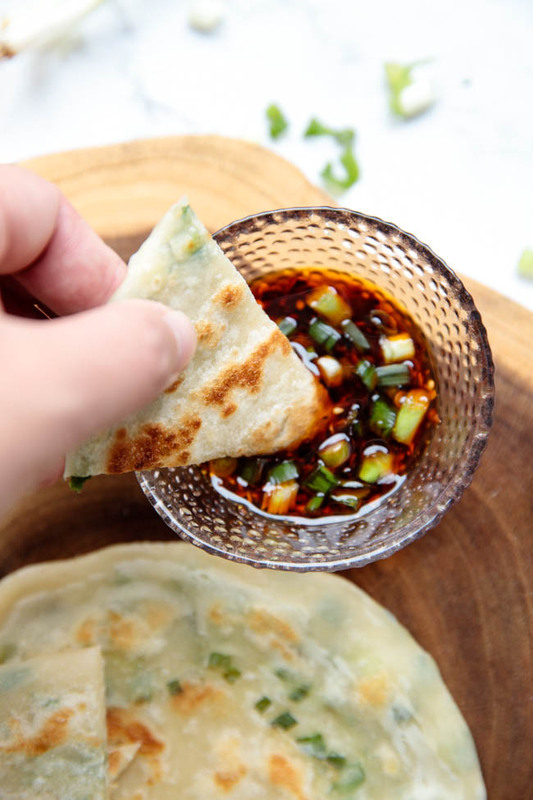 In Southern China, for example, Shanghai, scallion pancakes are thicker and fried with a larger amount of oil and create a even more crispy shell and softer inner part. In order to make the pancake chewy but still easy to cook, I use both hot boiling water and cold water. Hot boiling water dough (烫面) is soft when well cooked, while cold water dough (冷面) producing a chewier texture. I suggest using only the green part of scallion or green onion. The hard white part usually pierces the wrapper. It is quite important to rest the well shaped pancake just before the last rolling out. In every step of this recipe, cover your single dough with wet cloth to prevent drying out. Mix salt with all purpose flour.Prepare a large mixing bowl. Dig a small hole in center and then pour the hot water in. Wait for 10 minutes and then stir in the cold water and vegetable oil. 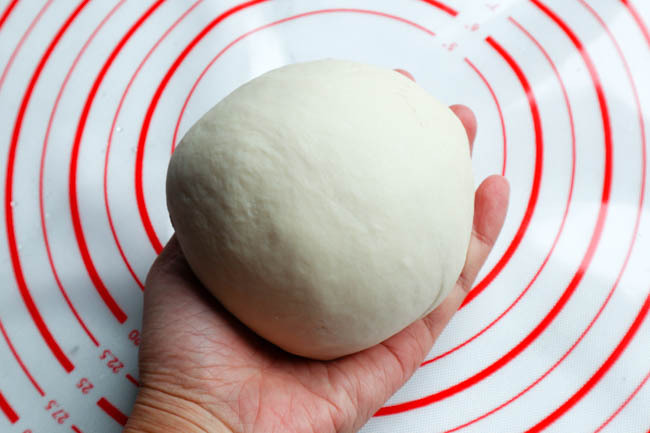 Grasp everything to form a ball, cover and rest for 5 minutes and then knead until very smooth (around 3-5 minutes ). The dough should be quite soft. Cover the rest for 20 to 30 minutes. After resting, the dough should be quite easy to roll out. Divide the large dough into 4 pieces and roll each piece into a large around circle. Brush some oil, sprinkle Chinese five spice power and chopped scallion (leave the 1 cm of the edge empty).Roll up the circle into a cylinder. And further roll into the shape of a snail. Cover with wet cloth and rest for 10 to 15 minutes. Then roll out the pancake to large around circle. Be gentle and use your hand as most as possible. To get a perfect round pancake for beginners, get yourself a small pan (18 to 20cm in diameter) and push with fingers to spread the dough over the pan. Brush some cooking oil on a pan and then place the rolled scallion pancakes. Use middle fire to pan-fry until the surface becomes brown around 2-3 minutes. And turn over to fry for another 1 to 2 minutes. Use a spatula to press the circle from time and time especially the central part to ensure the circle is evenly fried. Simplified scallion pancake, fried directly from batter. 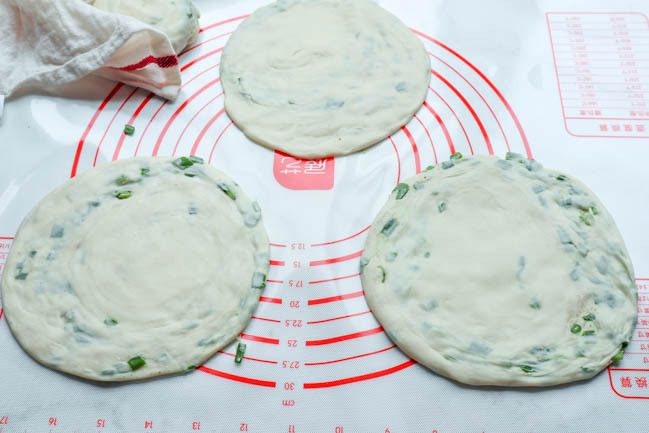 Detailed steps for making traditional Chinese scallion pancakes at home. Mix salt with all purpose flour. Prepare a large mixing bowl. Dig a small hole in center and then pour the hot water in. Wait for 10 minutes and then stir in the cold water and vegetable oil. Grasp everything to form a ball, cover and rest for 5 minutes and then knead until very smooth (around 3-5 minutes ). The dough should be quite soft. Cover the rest for 20 to 30 minutes. After resting, the dough should be quite easy to roll out. Divide the large dough into 4 pieces and roll each piece into a large around circle. Brush some oil, sprinkle Chinese five spice power and chopped scallion (leave the 1 cm of the edge empty). Roll up the circle into a cylinder. And further roll into the shape of a snail. Roll the snail out to another thin circle. Brush some cooking oil on the pan and move the circle into the pan. 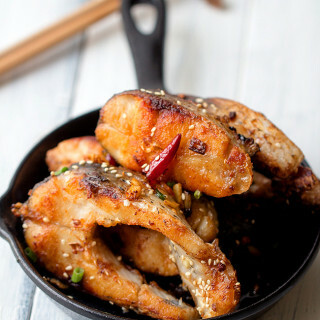 Use middle fire to pan-fry until the surface becomes brown around 2-3 minutes. And turn over to fry for another 1 to 2 minutes. Use a spatula to press the circle from time and time especially the central part to ensure the circle is evenly fried. Remove the circle out and cut into wedges. For a softer texture, add slightly more water. 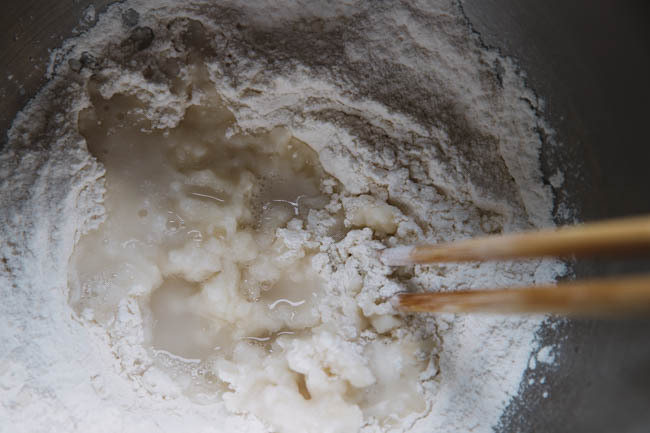 If you need to add the amount, during the process of making the circle, do cover the rest of dough with a wet cloth so that the dough will not be too dry. You should be proud because I did this for the 2014 new year’s eve. Great to make and to eat! We make this at least once per week usually for breakfast. I did this again yesterday and it turned out great… However what this goes with usually ? I have to say it is an independent food. In China, the pancakes are sold on street independently. But my choice is to match with a cup of soy milk or milk. 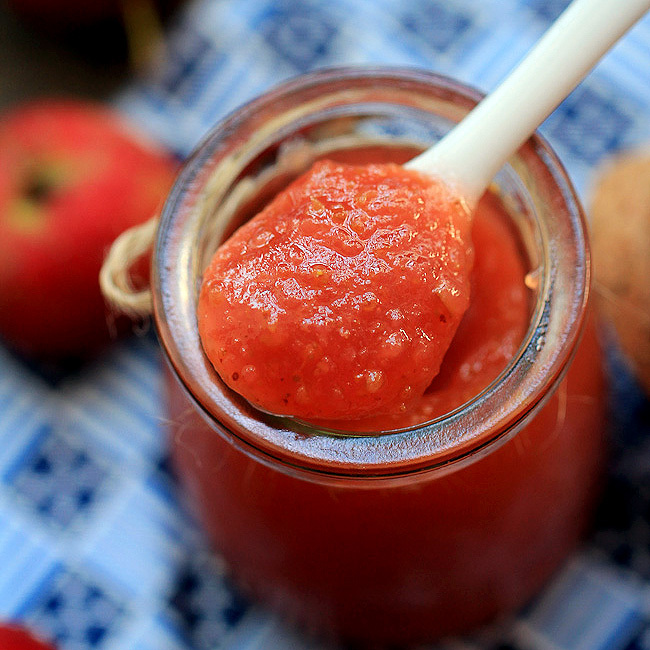 Besides, if you love spicy taste, you can match with a spicy dip. If you can get some (or make) marinated beef shin sliced up, and add some Chinese sweet sauce (what is normally used for Peking duck), then using the scallion cake as your vessel, I promise u won’t regret! That’s a wonderful idea! We will it into reality soon. Thanks for that sweet suggestion. This recipe looks just right for me! We sometimes use the pancakes to wrap a few thin slices of braised beef (similar to the shin) along with a couple of canned peeled hot peppers (剝皮辣椒/bopi lajiao, which are mild, not very hot). 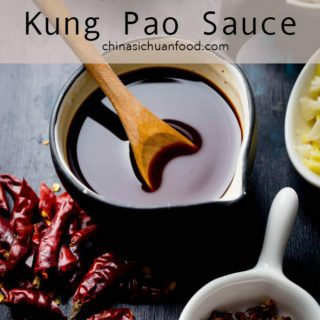 I’ll have to try it with duck sauce. With soya milk…Good idea, I’ll try this once I’ll make this again! 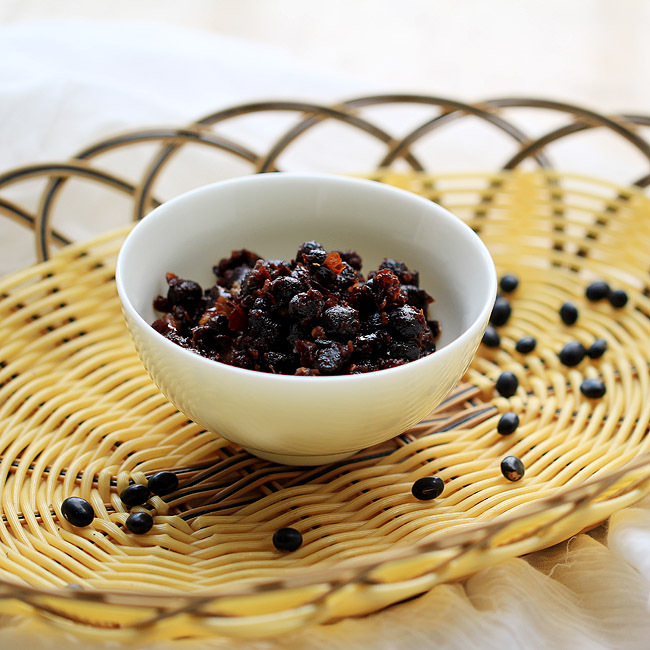 Yes, HK style food or Cantonese style usually are sweeter than the food in North China. I have made this back to 2 days ago and it is really super great. I love the crispy taste and your detailed photo guide. Good Job! Just made your scallion pancakes. They were delicious. I can’t believe I have never had them before. I think they will be on my regular cooking list from now on. Thanks Sally for your lovely feedback. 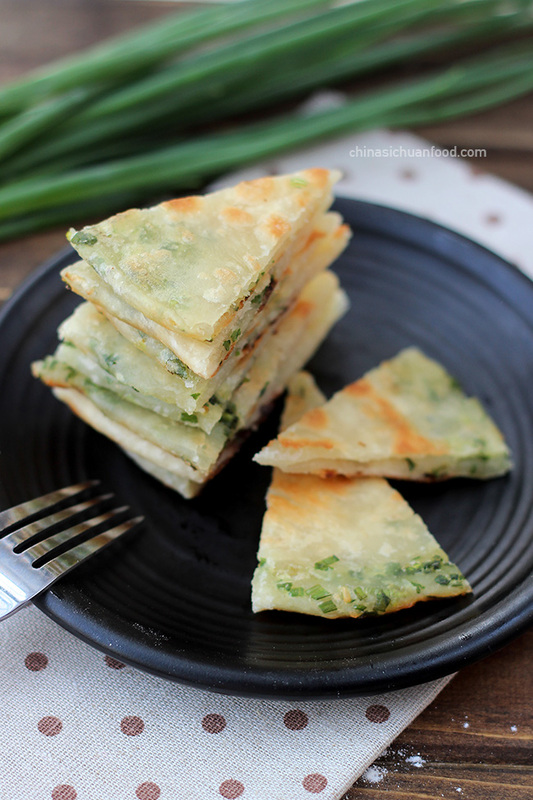 This scallion pancake is my super easy and yummy pancakes. Glad you like it too. So good!! My husband loved it 🙂 I like to sprinkle a bit of onion power on the dough. Less traditional but it enhances the green onion’s flavour a bit. Traditional way is just a reference. 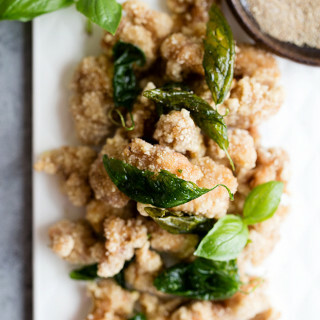 Making some changes based on the traditional ways can make dishes more interesting. I will try your suggestion next time. Thanks for the feedback. Thank you for sharing your recipe. I had chines scallion pancakes a couple of days ago, and I was wondering how to cook it. The texture is different from korean scallion pancakes. There are layer in the pancakes. The reason why it has different texture is rolling the dough. Very interesting!! I’ll try to make chinese pancakes at home. Thank you again! You are welcome! And Michelle, you are a great observer. The layers makes the green onions and other seasonings combined well. Hope you enjoy it and I look forward to your feedback. Can these be cooked and then frozen for future use? I do not recommend frozen cooked pancakes. 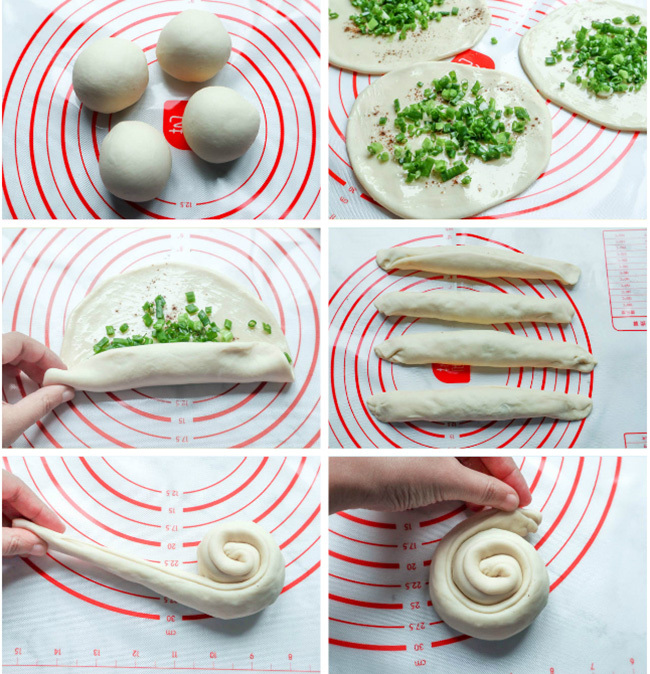 I would love to refrigerator the dough without green onions. Wrap the dough separately with plastic bags and roll it out and garnish seasonings and green onion when you need to use it. 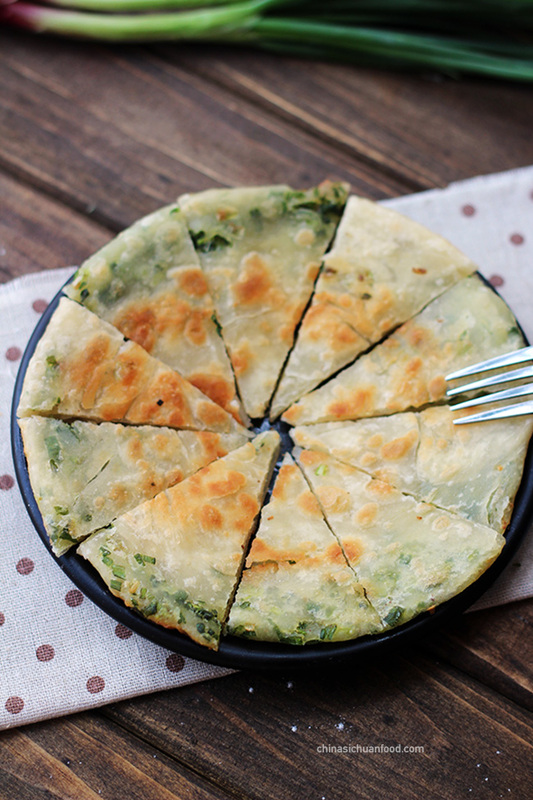 Chinese scallion pancake is different from Korean style. Sometimes, we call this as multiple layer pancake. It is one of my favorite breakfast. 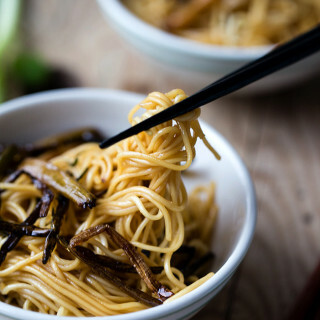 I made this recipe but used green onions …..is that scallions? I found them too watery and the dough was then hard to roll out, getting wet. Next time i am going to use chives….will this change the recipe much? The chives taste sharper but much like a green onion. Please advise as we like “a lot” of flavour in our food. Sure, you can use chive to replace green onions. I have tried with the three and all comes out great. If you find your dough too watery to roll out, brush some oil on your operating board can help. It is like every one of your posts takes me back to some memorable experience – these take me back to Singapore – Yum! Can I just confirm it is 150g of water not 150ml? Thanks! Your pancakes look great! But are you sure, that the flour:water ratio is correct? Maybe you meant a volume scale instead of mass? 300g Flour is 3 times the volume of 150g Water. 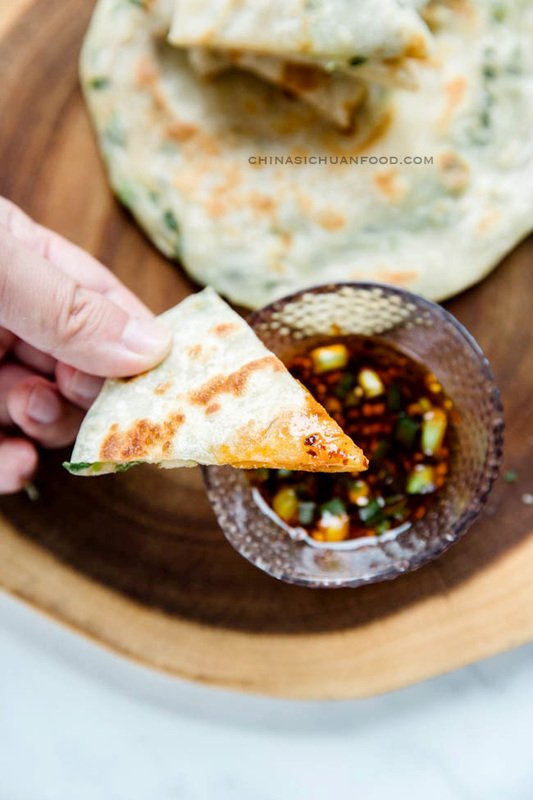 Traditional Chinese scallion pancake is very chewy. So the basic weight ratio between flour and water should be 2:1. And after resting, the dough will become softer. However you can add around 20ml more water for a softer texture. Thanks for the feedback. I will mark as a note for following readers. I was confused because you stated the dough should be softer than pizza dough. But I think I misinterpreted that. It turned out, that the *boiling* water is the key to success. It really needs to be boiling than the glutenchains are not able to form the spongy networks and the dough becomes dense but also soft! It then becomes easy to roll out and the fried pancakes are really chewy and fantastic! With american all-purpose type (german 405, italian 00) your water quantities are working fine. Thanks Bonk for your detailed feedback. I should have pointed the truth out that flour of different brands have different water absorbing capacity due to different protein levels. Thanks so much for your detailed information about the flours in different country because I am really not familiar with them. Just learn lots of useful information from your comment. Thank you for showing us how to make these scallion pancakes. Since having them in HK, I always wondered if I could make them thinner and crispier than the ones they serve in the restaurants. But you mention that the Korean ones are multi=layered. I would be grateful if you could tell me how this is achieved. I don’t have the scale, can you tell me how much is 300 g of flour? I look it up online and they say it’s about 2.5 cups. Is that about the right amount ? Usually one cup flour yield 145g flour. So it should be around 2 cups plus and 2 tablespoons. Love your website! I was wondering if you could answer a few of the questions. Thanks! Do you know what is in the sauce that is given with the scallion pancakes? My best guess would be soy sauce, scallions and sugar. Also do you have a suggested way for storing the pancakes already made? I am on time crunch many days but this would be a quick amazing breakfast. We do not match scallion pancake with sauce usually, so I cannot figure out the one you are referring. But soy sauce, sugar and scallion sound a reasonable sauce. If you need to prepare a quick breakfast in next morning, make the dough firstly and then finish all the assembling process expect the last rolling out process. Cover the small dough with plastic wrapper and store in refrigerator. Next morning, roll out and fry directly. Or if you already fried the pancake, it is ok to re-heat it in oven. I’m making these now…. Is the dough supposed to be sticky? Thanks for the recipe, looks delicious!! It might be sticky, you need to shape it on a oily surface. I made this yesterday. Instead of using only plain flour I used half whole wheat flour and half plain flour. It came out very good. We had it with tamatar gosht ( an Indian lamb curry). Everyone liked it. Thanks a lot. Nice idea to serve this with any stew or soups.Thanks for the kind feedback and whole wheat flour is much healthier. happy cooking! I can’t wait to try this! I love scallion pancakes, but have never made them myself. I hate working with dough, but am trying to move past that so I can create more dishes. Thanks for the motivation! 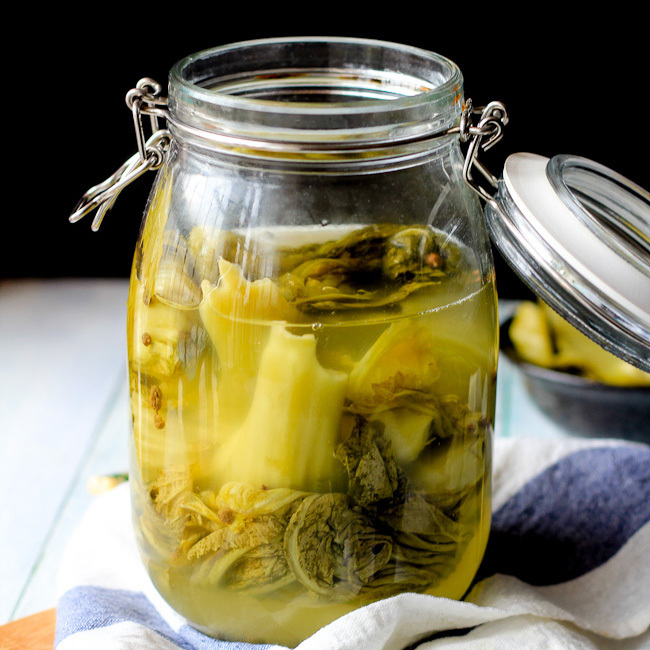 Up here in northwestern Canada we make these with a 50/50 mix of flour and cornflour other than that exactly like this recipe and then serve them with chianking vinegar and sambal olek to taste. They are to die for that way too. I’ve been looking for a good recipe for ages! My hometown Chinese take-out in NY had them and it was my go-to appetizer, plus I enjoyed buying them several times on the street during China Town trips. Now I live in south carolina and the chinese take-outs are so different and I haven’t even found one that offers pancake appetizer. I tried a couple other recipes, but this one is just like the pancakes I used to enjoy and have missed so much! Thanks for sharing. 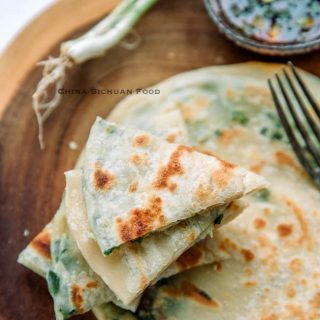 There are actually several types of scallion pancakes– this one is quite popular in Northern China with thinner layers and more chewier than Shanghai style. I hope it comes out great on your side too. Happy cooking! I was wondering do you use bleached flour or I bleached flour to make this dish? I can’t wait to try to make this onion pancake one day. I meant do use bleached or unbleached flour? I prefer unbleached flour for all kinds of pancakes. I made this, it was very good. But I should have made 2 or 3, it was not enough for two hungry adult haha. Each time when I make this scallion pancake, I get complains about the limited amounts too. Wow thank you for this recipe!! This the BEST scallion pancakes I ever had! I tried so many times to make scallion pancakes but they turned out poorly until I try your recipe. Your instructions were very clear and perfect and the photos very helpful. Thank you so much!! Thanks Alisa for your wonderful feedback and your lovely dipping sauce. It would be extremely helpful. I ate the scallion pancakes as part of lunch and had wonton soup and egg rolls with it. So delicious! 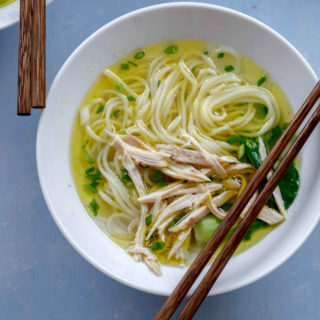 Brilliant idea to match it with soups. What is in the dipping sauce? I use 1 tbsp. light soy sauce + 1/2 tbsp. 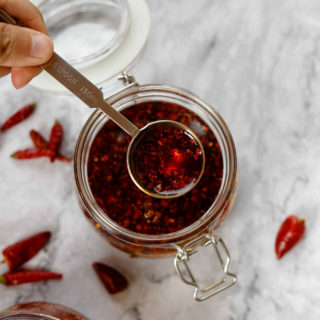 Chinese chili oil + 1 tbsp. water +1/2 tsp. sugar + chopped scallion and toasted white sesame seeds.